"An open road and your favorite song, is sometimes all the therapy you need." Our trip took us five days of driving with several stops along the way. The best part about driving across the country is seeing truly how different our country is. Every state we drove through the scenery changed and so did the speed limit. Our first major stop was in Rapid City, South Dakota. 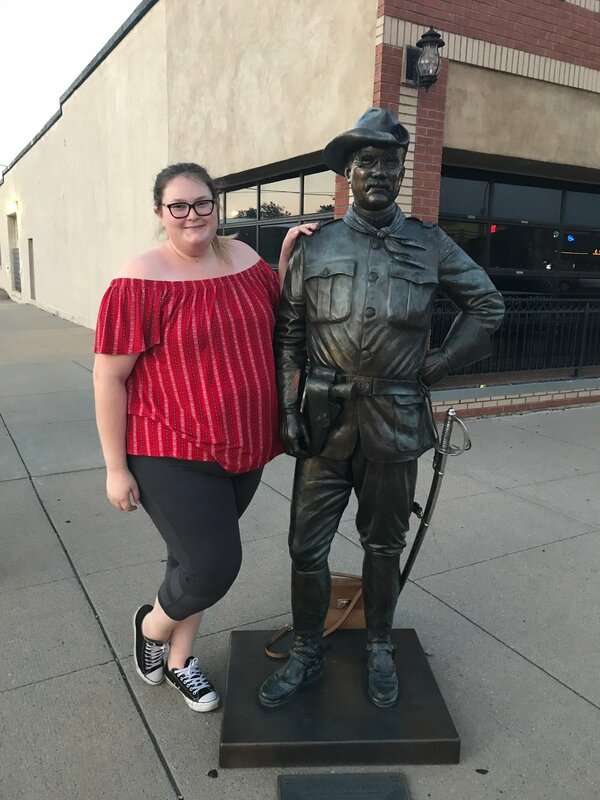 We went out to dinner, at a restaurant that I had eaten at when I was there as an eight year old, and walked around the downtown area to take photos with the most important Presidential statues. Of course I recreated photos that I took as a kid, and Mikaela had to take a photo with her favorite president, Thomas Jefferson. My major piece of advice is, stop along the drive. Take photos with random animal statues, take a lot of car selfies rocking out to your favorite songs, and always take photos of the new state signs! The main point of the route that we took was that we wanted to go to Mount Rushmore. It is honestly so cool and the magnitude of having a face carved that big into a mountain is crazy. It's something that you see online and think that's cool and if I get there someday that could be cool, but honestly it is worth the trip to see it. I have been three times in my short life and it is still mesmerizing to this day. It is always okay to let out your inner child and go to places to create lasting memories. So Mikaela and I did just that on our drive east. We stopped at Wall Drug in Wall, South Dakota to take photos on giant animals and fake trains. It's also a fun place to stop for some lunch and take some fun pictures. 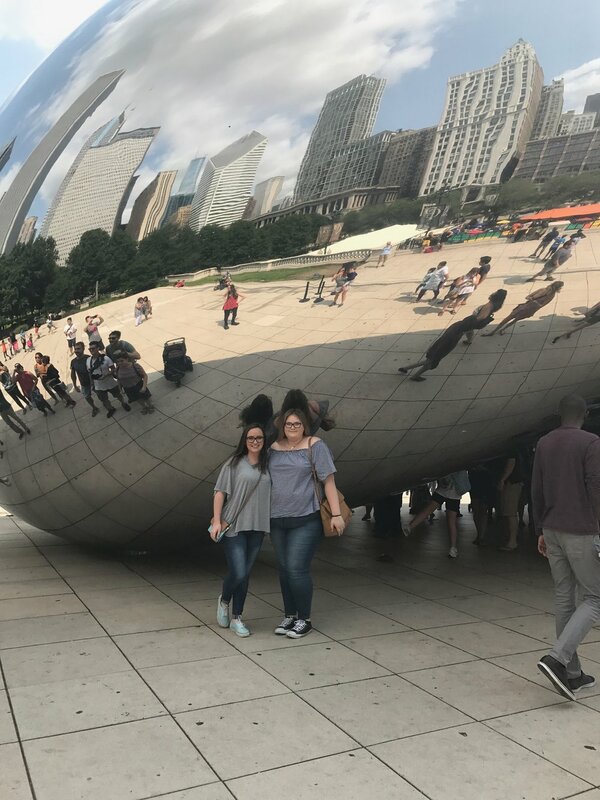 After driving to about an hour outside of Milwaukee from Rapid City we woke up the next morning and headed for Chicago to get a photo with The Bean, and see if I could hunt down the two loves of my life; Jay Halstead and Adam Ruzek. Our plan was to stop and get pizza, but man the wait time was over two hours! Note: if you are headed for Chi Town call in your pizza order before you want to go to save lots of time, in addition if you are paying to park in the city buy it ahead of time because you will save a bunch of money!. I will say the vibes of this city were so cool and I'm so sad I never got to visit my best friend when she moved there when we were kids. After a whirl wind hour and a half in Chicago we were back on the road headed for Michigan. I have to say the scenery in this part of the country is unlike anything I have ever seen before. Outside the trip I took to Ireland I have never seen anything so lush and green. So we took a small (not really that small) detour on to Grand Rapids, Michigan so that we could see Set It Off in concert. It was so fun and I have been listening to their album on repeat since I got on the plane back to Los Angeles, they were my flying buddies in a way. The last day of driving on our trip was super long, but was so fun. We drove through five different states in one day, and the only part that was bad was the bumper to bumper traffic we sat in for three hours in Cincinnati... But in all honesty the glee fangirl that lives on in my heart freaked out that we got to drive through the town of Lima, Ohio. One of the coolest parts of my trip was that I was in the path of totality when the solar eclipse passed over South Carolina. They say that it is a once in a lifetime opportunity and honestly it was the coolest experience to have it be midday and feel as though it was night, including hearing all of the crickets coming out. If you find a person who loves to adventure like you, make them your best friend and do all the crazy things you can with them because it will be the most rewarding and memory making trips in life. 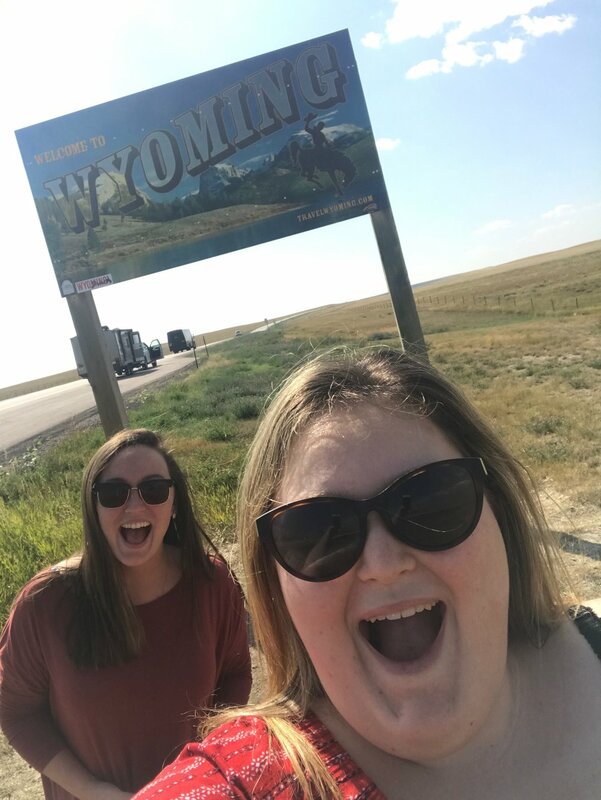 Hey, my best friend and I ran across a highway in Wyoming just to get a selfie like this. If you are in search of some music to play on your next road trip here is my compilation of songs that I rock out to on the road. Leave me a comment down below where I should go on my next road trip; tell me a state, an attraction, a restaurant, or even just a general section of the US I should check out next.